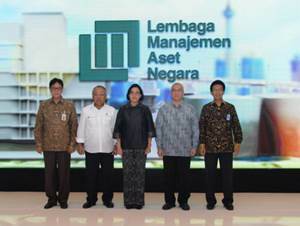 Lembaga Manajemen Aset Negara - LMAN is the State Asset Management Agency of Indonesia. LMAN is Public service agency (BLU) under the Directorate General of State Assets of The Ministry of Finance (DJKN Kemenkeu). The Agency was officially established on 16 December 2015 and its operation started on June 2016. The legal basis for the establishment of LMAN is Presidential Decree 102 of 2016 concerning Funding of Land Procurement for Development for Public Interest in the Framework of Implementation of National Strategic Project, and PMK 219/PMK.01/2015 on Organization and Working Procedure of State Asset Management Agency. According to information found in the Kemenkeu's website as cited by JobsCDC.com, LMAN carries out the mandate of state property managers, advisory services, and land funding of the National Strategic Project (land funding). In addition to being a manager of state assets, LMAN also conducts funding and land use planning for land bank and compensation payments for land acquisition. LMAN is also established to support the optimization of state asset management in order to improve economic and social benefits, as well as to explore the potential return on assets and Non-Tax State Revenues (PNBP) derived from State Property. Maximum age of 33 years old as of 31 May 2018. Minimum education S1 Civil Engineering (Structure and Construction Management) with minimum GPA of 2.75 on 4.00 grade scale. Preferably have 3 years of experience in the field of Site / Civil Engineer (construction). Preferably have expertise certification (SKA), minimum of one type of SKA ie Construction Expert. Have portfolio of at least 2 (two) construction projects. Minimum education S1 Architecture Engineering (Interior/Exterior) with minimum GPA of 2.75 on 4.00 grade scale. Preferably have 3 years of experience in the field of architecture. Preferably have green building certification. Minimum education S1 Law (Civil Law) with minimum GPA of 2.90 on 4.00 grade scale. Preferably have 3 years of experience in the field of Civil Law. Preferably have expertise certification (SKA). Have portfolio of at least become team members in terms of civility. Minimum education D3 Informatics Engineer (Programmer) with minimum GPA of 2.75 on 4.00 grade scale. Preferably have 2 years of experience in the field of programming. Minimum education S1 Economics, Economics Development with minimum GPA of 2.90 on 4.00 grade scale. Preferably have 2 years of experience in the field of economics research. Have portfolio involved in at least 2 preparation of economic / development studies. Minimum education S1 Accounting with minimum GPA of 2.90 on 4.00 grade scale. Preferably have 3 years of experience in the field of accounting and asset management. Preferably have Chartered Accountant certification. Have portfolio involved in the preparation or audit of 2 financial reports. JobsCDC.com now available on android device. Download now on Google Play here. Please be aware of recruitment fraud. The entire stage of this selection process is free of charge. Lembaga Manajemen Aset Negara - Non CPNS Staff LMAN Kemenkeu March 2018 will never ask for fees or upfront payments for any purposes during the recruitment process such as transportation and accommodation.